A paper published today in Quaternary Science Reviews reconstructs temperatures in southern Sweden over the past 10,000 years and finds 2 more non-hockey-sticks with both annual and summer temperatures showing a long-term cooling over the past ~7,000 years. The paper shows the Medieval, Roman, Minoan, Egyptian and Holocene Climate Optimum warming periods were all warmer than modern temperatures. First graph at left side shows annual temperatures have declined over the past ~7000 years since the Holocene Climate Optimum. Vertical axis is years before the present. New isotopic lake sediment sequence from the Baltic Sea island of Gotland. The lake's paleohydrology is sensitive to the intensity of the Siberian High. Polar air outbreaks across the region were more frequent after c. 6000 cal. yr BP. Oxygen (δ18O) and carbon (δ13C) isotope records of calcitic carbonate components (Chara sp. algal encrustations and Bithynia tentaculata gastropod opercula) from a lake-sediment succession on the Baltic Sea island of Gotland, south-eastern Sweden, have been obtained to investigate regional climate dynamics during the Holocene. The hydrological sensitivity of the small lake, particularly in terms of spring snowmelt contribution to the local water budget, provides a means of tracing past changes in the influence of snow-bearing easterly winds across the Baltic Sea Proper, which signifies the wintertime strength of the Siberian High. Repeated episodic depletions in 18O at the centennial scale correlate with events of increased potassium concentration in the GISP2 ice-core record from Greenland, which indicates a coupling to large-scale fluctuations in atmospheric circulation patterns. A corresponding correlation with simultaneous depletions in 13C suggests repeated responses of the local lake hydrology to snow-rich winters through decreasing water residence time, perhaps augmented by methanogenesis due to prolonged ice-cover seasons under the influence of an expanding Siberian High. 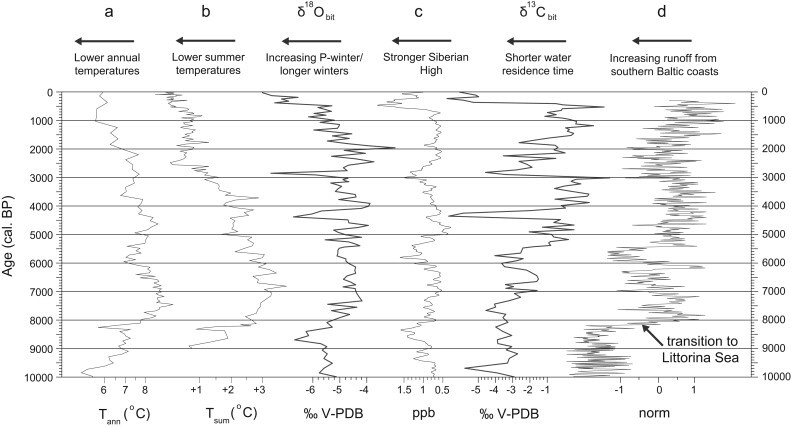 Frequency analysis of the isotopic records reveals well-defined fluctuations at quasi-500-520-, 670-, 830- and 1430-yr periodicities, and a gradually stronger impact of Polar air outbreaks across the southern Baltic Sea region with time after ca 6000 cal. BP.